Sally Ride, the first American woman to fly in space, passed away on Monday after 17-months of battling pancreatic cancer. An eloquent obituary is posted on her website. Ride lived a full life and used her high profile to campaign for what she believed in: encouraging young people to be adventurous, to explore and learn about science, and to develop careers in sciences and engineering. After two flights to space, Ride became the first director of NASA’s Office of Exploration, was a science fellow at Stanford University, joined the faculty at University of California San Diego, and served as a Presidential advisor, and investigated both the Challenger and Columbia space shuttle explosions. 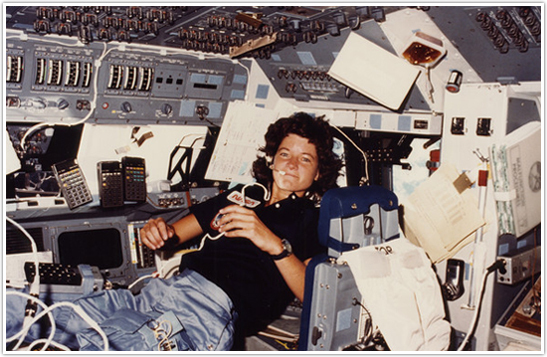 In 2001, Ride founded Sally Ride Science to create classroom materials and programs, as well as teacher development training, that encourage girls and boys to pursue their interests in science, technology, engineering, and math. She also co-wrote several books for children about science with her long-time partner, Tam E. O’Shaugnessy. Ride is a member of the National Women’s Hall of Fame, the California Hall of Fame, the Aviations Hall of Fame, and the Astronaut Hall of Fame. She’s received many honors and awards, included two NASA Space Flight Medals and the Jefferson Award for Public Service. This entry was posted in National News and tagged #leadership, #NASA, #pathbreaker, #sallyride, #women'sleadership. Bookmark the permalink.